Human trash now litters space in the form of broken hardware and spacecrafts circling Earth. But the Surrey Space Center is working on tackling the issue – and they just got a boost from SpaceX. Their RemoveDEBRIS technology demonstrator is hitching a ride aboard a SpaceX Falcon 9 rocket to the International Space Station (ISS), where it will hunt space debris using a harpoon and net. Scientists could obtain information on which space junk cleanup strategy works with the RemoveDEBRIS technology demonstrator, which consists of “a main satellite platform that once in orbit will deploy two CubeSats as artificial debris targets to demonstrate some of the technologies,” according to the project page. The platform is packed in specialist boxes ISS astronauts will unpack. The technology will be released outside of the space station via a robotic arm. Harpoon capture, net capture, dragsail, and vision-based navigation are the technologies to be tested on the mission. The European Commission is providing half of the funding; the partners, including Airbus and Surrey Satellite Technology Limited, will provide the other half. SpaceX said the Dragon spacecraft, which is carrying RemoveDEBRIS among other supplies and payloads on Dragon Resupply Mission CRS-14, separated from the Falcon 9’s second stage around 10 minutes following liftoff, and will attach to ISS on Wednesday. Harpoon method for capturing space junk. Net method for capturing space junk. Removing space junk by RemoveDEBRIS. A space junk technology demonstrator hitched a ride to the International Space Station aboard SpaceX's Falcon 9 rocket. 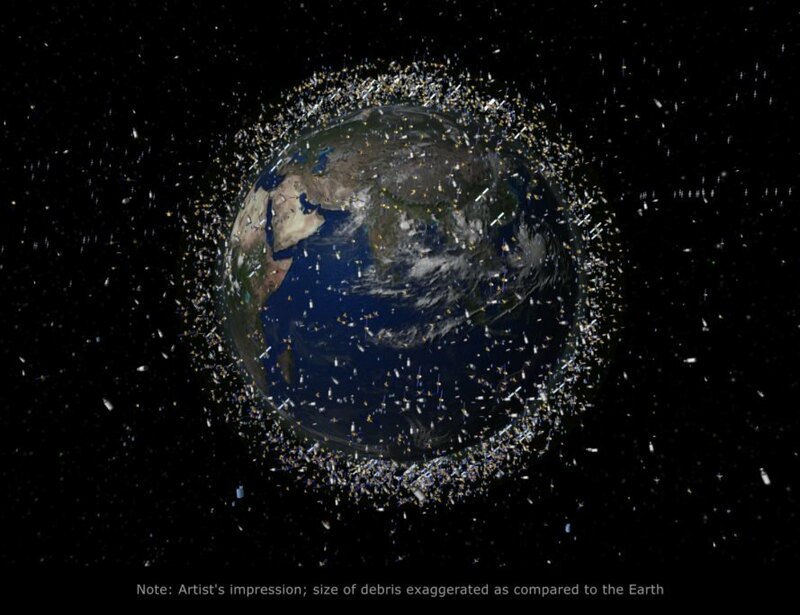 This is an artist's impression of space debris via the European Space Agency (ESA).